So its that time of the Year again when Chanel brings out its Limited Edition 'on trend' Nail Polish...and this Spring/Summer colour is yellow. 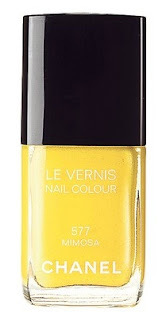 Chanel Mimosa is a bright sunshine yellow with gold shimmer and its part of the LesFleaurs d'Ete Collection. It is hot to be the colour of the season with lots of celebrities,such as Katy Perry, Rihanna, Gwen Stefani & Lady Gaga sporting yellow nails - the trick is choosing a bright neon shade to prevent your nails looking like you have had too many fags! If you don't want to splurge £17.50 for the Chanel version,there are many cheaper dupes out there such as Maybelline's Banana Bamba (£6), Orly Lemonade (£5), China Glaze Lemon Fizz (£5), OPI Buttercup Yellow (£10), Revlon Yellow Nail Polish (£6.49), Models Own Lemon Sherbet (£5). So whats the verdict on Yellow Nails, yey or nay? Ahh thank you for the dupe list! I had tried the Chanel on some sellotape and held it against my nail at a counter and although it was a nice colour I wasn't really prepared to pay a whopping £17.50 for a nail polish! Yellow such a happy colour, it makes me smile! So YES yellow nails! You can look at your hands and smile because you've got such a pretty colour painted on your nails!